How to apply my wireless settings to access points using the D-Link DWC-1000? Step 1: Log into the setup page of the DWC-1000. Step 2: Go to the Advanced tab. Click on AP Profile. Step 4: Check the checkbox for the desired AP Profile. Click on the Apply button. A message will appear stating the APs will restart, and clients will be disconnected during this time. Click Ok to proceed with pushing out the profile to the APs. Step 5: When the profile has been pushed to the APs, the Profile Status will change to Associated. The default wired interface settings, which include DHCP and VLAN information, might not work for all networks.By default, the DHCP client on the UAP automatically broadcasts requests for network information. If you want to use a static IP address, you must disable the DHCP client and manually configure the IP address and other network information. The management VLAN is VLAN 1 by default. This VLAN is also the default untagged VLAN. If you already have a management VLAN configured on your network with a different VLAN ID, you must change the VLAN ID of the management VLAN on the AP. To configure the LAN settings, click the Ethernet Settings tab. The following table describes the fields to view or configure on the Ethernet Settings page. Enter a hostname for the AP. The hostname appears in the CLI prompt. •) The length must be between 1 – 63 characters. •) Upper and lower case characters, numbers, and hyphens are accepted. •) The first character must be a letter (a – z or A – Z), and the last character cannot be a hyphen. Shows the MAC address for the LAN interface for the Ethernet port on this AP. This is a read-only field that you cannot change. The management VLAN is the VLAN associated with the IP address you use to access the AP. The default management VLAN ID is 1.Provide a number between 1 and 4094 for the management VLAN ID. If you disable the untagged VLAN, all traffic is tagged with a VLAN ID.By default all traffic on the UAP uses VLAN 1, which is the default untagged VLAN. This means that all traffic is untagged until you disable the untagged VLAN, change the untagged traffic VLAN ID, or change the VLAN ID for a VAP or client using RADIUS. Provide a number between 1 and 4094 for the untagged VLAN ID. Traffic on the VLAN that you specify in this field will not be tagged with a VLAN ID. If you select DHCP, the UAP acquires its IP address, subnet mask, DNS, and gateway information from a DHCP server. If you select Static IP, you must enter information in the Static IP Address, Subnet Mask, and Default Gateway fields. Enter the static IP address in the text boxes. This field is disabled if you use DHCP as the connection type. Enter the Subnet Mask in the text boxes. Enter the Default Gateway in the text boxes. Select the mode for the DNS. In Dynamic mode, the IP addresses for the DNS servers are assigned automatically via DHCP. This option is only available if you specified DHCP for the Connection Type. In Manual mode, you must assign static IP addresses to resolve domain names. Enable or disable IPv6 auto address configuration on the AP.When IPv6 Auto Config Mode is enabled, automatic IPv6 address configuration and gateway configuration is allowed by processing the Router Advertisements received on the LAN port. 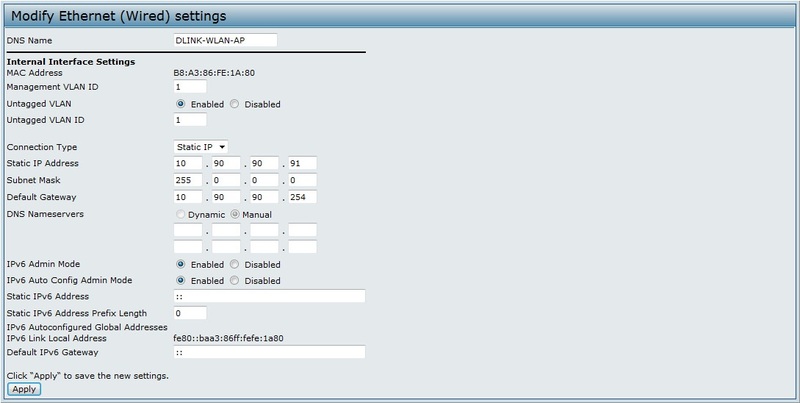 The AP can have multiple auto configured IPv6 addresses. Enter a static IPv6 address. The AP can have a static IPv6 address even if addresses have already been configured automatically. Enter the static IPv6 prefix length, which is an integer in the range of 0 – 128. If the AP has been assigned one or more IPv6 addresses automatically, the addresses are listed. Shows the IPv6 Link Local address, which is the IPv6 address used by the local physical link. The link local address is not configurable and is assigned by using the IPv6 Neighbor Discovery process. Note: After you configure the wired settings, you must click Apply to apply the changes and to save the settings. Changing some settings might cause the AP to stop and restart system processes. If this happens, wireless clients will temporarily lose connectivity. We recommend that you change AP settings when WLAN traffic is low. 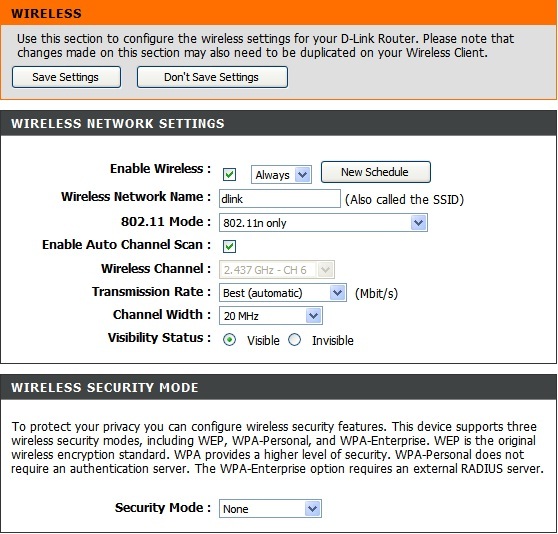 Wireless settings describe aspects of the local area network (LAN) related specifically to the radio device in the access point (802.11 Mode and Channel) and to the network interface to the access point (MAC address for access point and Wireless Network name, also known as SSID). 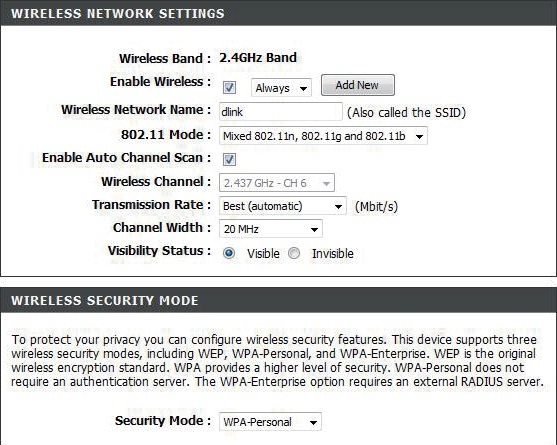 To configure the wireless interface, click the Manage > Wireless Settings tab. The following table describes the fields and configuration options available on the Wireless Settings page. Specify the time interval (in seconds) for the AP to report (through the system log and SNMP traps) associated clients that do not adhere to mandatory admission control procedures. Specify whether you want the radio interface on or off. Indicates the Media Access Control (MAC) addresses for the interface. Dual-radio APs have a unique MAC address for each radio. A MAC address is a permanent, unique hardware address for any device that represents an interface to the network. The MAC address is assigned by the manufacturer. You cannot change the MAC address. It is provided here for informational purposes as a unique identifier for an interface. The Mode defines the Physical Layer (PHY) standard the radio uses. Note: The modes available depend on the country code setting and the radio selected.Select one of the following modes for radio 1:•) IEEE 802.11a is a PHY standard that specifies operating in the 5 GHz U-NII band using orthogonal frequency division multiplexing (OFDM). It supports data rates ranging from 6 to 54 Mbps. •) IEEE 802.11a/n operates in the 5 GHz ISM band and includes support for both 802.11a and 802.11n devices. IEEE 802.11n is an extension of the 802.11 standard that includes multiple-input multiple-output (MIMO) technology. IEEE 802.11n supports data ranges of up to 248 Mbps and nearly twice the indoor range of 802.11 b, 802.11g, and 802.11a. as well as complementary code keying (CCK) to provide the higher data rates. It supports data rates ranging from 1 to 11 Mbps. IEEE 802.11g is a higher speed extension (up to 54 Mbps) to the 802.11b PHY. It uses orthogonal frequency division multiplexing (OFDM). It supports data rates ranging from 1 to 54 Mbps. •) IEEE 802.11b/g/n operates in the 2.4 GHz ISM band and includes support for 802.11b, 802.11g, and 802.11n devices. •) 2.4 GHz IEEE 802.11n is the recommended mode for networks with 802.11n devices that operate in the 2.4 GHz frequency that do not need to support 802.11b/g devices. IEEE 802.11n can achieve a higher throughput when it does not need to be compatible with legacy devices (802.11b/g). The range of available channels is determined by the mode of the radio interface and the country code setting. If you select Auto for the channel setting, the AP scans available channels and selects a channel where no traffic is detected. The Channel defines the portion of the radio spectrum the radio uses for transmitting and receiving. Each mode offers a number of channels, depending on how the spectrum is licensed by national and transnational authorities such as the Federal Communications Commission (FCC) or the International Telecommunication Union (ITU-R). When automatic channel assignment is enabled on the Channel Management page for Clustering, the channel policy for the radio is automatically set to static mode, and the Auto option is not available for the Channel field. This allows the automatic channel feature to set the channels for the radios in the cluster. Check the box to enable the wireless function. If you do not want to use wireless, uncheck the box to disable all the wireless functions. Select the time frame that you would like your wireless network enabled.The schedule may be set to Always. Any schedule you create will be available in the drop-down menu. Click New Schedule to create a schedule. Service Set Identifier (SSID) is the name of your wireless network. Create a name for your wireless network using up to 32 characters. The SSID is case-sensitive. 802.11b Only – Select only if all of your wireless clients are 802.11b. 802.11g Only – Select only if all of your wireless clients are 802.11g. 802.11n Only – Select only if all of your wireless clients are 802.11n. Mixed 802.11g and 802.11b – Select if you are using both 802.11g and 802.11b wireless clients. Mixed 802.11n and 802.11g – Select if you are using both 802.11n and 802.11g wireless clients. Mixed 802.11n, 11g, and 11b – Select if you are using a mix of 802.11n, 802.11g, and 802.11b wireless clients. The Auto Channel Scan setting can be selected to allow the DIR-865L to choose the channel with the least amount of interference. Indicates the channel setting for the DIR-865L. By default the channel is set to 6. The Channel can be changed to fit the channel setting for an existing wireless network or to customize the wireless network. If you enable Auto Channel Scan, this option will be greyed out. Auto 20/40 – This is the default setting. Select if you are using both 802.11n and non-802.11n wireless devices. 20MHz – Select if you are not using any 802.11n wireless clients. 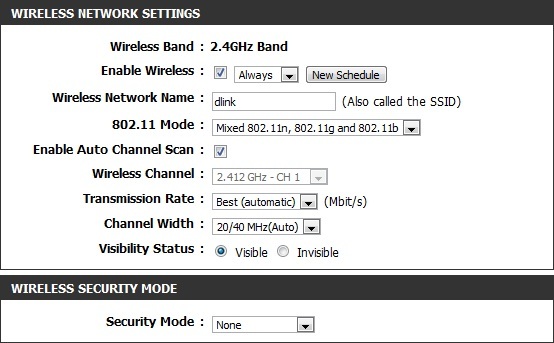 Select Invisible if you do not want the SSID of your wireless network to be broadcasted by the DIR-865L. If Invisible is selected, the SSID of the DIR-865L will not be seen by Site Survey utilities so your wireless clients will have to know the SSID of your DIR-865L in order to connect to it. Refer to page 46 for more information regarding wireless security. If you want to wirelessly connect multiple Ethernet-enabled devices such as game consoles, media players, or network attached storage (NAS) devices you can set the DIR-865L to Bridge mode. You must have a wireless router for this feature. Note: For 802.11ac performance, you must connect to another 802.11ac wireless router. The DIR-865L will automatically adjust to the connection type of your router. Step 1 – From the Setup > Internet page, click Manual Internet Connection Setup and then check the Enable Wireless Bridge box. Click Save Settings and then click OK to the pop-up message. Note: When you enable Bridge mode, the DIR-865L’s default IP address will change to 192.168.0.50. Step 2 – The following message will appear. The router will automatically reboot. Step 3 – Once the router reboots, you may get a “connect display page” error on your web browser. This is because the IP address of the router changed. In your web browser, enter http://192.168.0.50 to access the web interface. Step 4 – At the login screen, enter admin for the User Name and enter your password (leave blank by default). 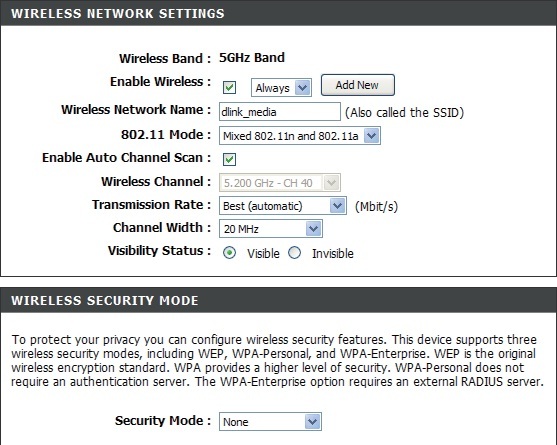 Step 5 – From the Setup > Wireless Settings page, click the Site Survey button. This will display a list of wireless networks in your area.You may also manually enter the wireless network name you want to connect to (SSID) and any security/encryption settings (from the Security Mode drop-down menu). Enter your wireless network information, click Save Settings, and then skip to step 7. Step 6 – When the site survey screen appears, select the network you want to connect to (click the radio button under Select) and then click Connect. If the network is secure/encrypted, you will need to enter the passphrase/encryption key.Please allow a minute to connect. Step 7 – Once connected, any Ethernet device connected to the DIR-865L will connect to the wireless network. 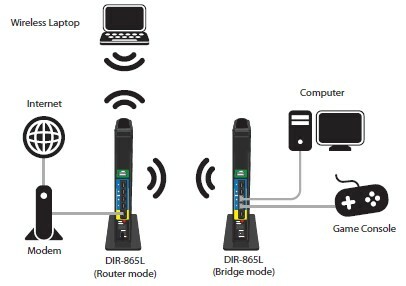 Note: Wireless clients cannot connect to the DIR-865L while in bridge mode.Also, the Internet port on the D-Link DIR-865L in Bridge mode will not function. Select the time frame that you would like your wireless network enabled. The schedule may be set to Always. Any schedule you create will be available in the drop-down menu.Click Add New to create a new schedule. Service Set Identifier (SSID) is the name of your wireless network. Create a name using up to 32 characters. The SSID is case-sensitive. 802.11g Only – Select if all of your wireless clients are 802.11g.Mixed 802.11n and 802.11g – Select if you are using both 802.11n and 802.11g wireless clients.802.11n Only – Select only if all of your wireless clients are 802.11n. The Auto Channel Scan setting can be selected to allow the DIR-857 to choose the channel with the least amount of interference. Indicates the channel setting for the DIR-857. By default the channel is set to 6. The Channel can be changed to fit the channel setting for an existing wireless network or to customize the wireless network. If you enable Auto Channel Scan, this option will be greyed out. Select the transmit rate. It is strongly suggested to select Best (Auto) for best performance. Select Invisible if you do not want the SSID of your wireless network to be broadcasted by the DIR-857. If Invisible is selected, the SSID of the DIR-857 will not be seen by Site Survey utilities so your wireless clients will have to know the SSID of your DIR-857 in order to connect to it. Refer to page 85 for more information regarding wireless security. Select the time frame that you would like your wireless network enabled. The schedule may be set to Always. Any schedule you create will be available in the drop-down menu. Click Add New to create a new schedule. 802.11a Only – Select if all of your wireless clients are 802.11a. Mixed 802.11n and 802.11a – Select if you are using both 802.11n and 802.11a wireless clients. Indicates the channel setting for the DIR-857. By default the channels set to 6. The Channel can be changed to fit the channel setting for an existing wireless network or to customize the wireless network. If you enable Auto Channel Scan, this option will be greyed out. Wireless or Wi-Fi technology is another way of connecting your computer to the network without using wires. Wi-Fi uses radio frequency to connect wirelessly, so you have the freedom to connect computers anywhere in your home or office network. D-Link is the worldwide leader and award winning designer, developer, and manufacturer of networking products. D-Link delivers the performance you need at a price you can afford. D-Link has all the products you need to build your network. D-Link DIR-655 products provide 14x faster and 6x farther range than 802.11g. In simple terms: a noticeably stronger connection at distance. The schedule of time when the wireless settings rules will be enabled. The schedule may be set to Always, which will allow the particular service to always be enabled. You can create your own times in the Tools > Schedules section. The Auto Channel Scan setting can be selected to allow the DIR-655 to choose the channel with the least amount of interference. Indicates the channel setting for the DIR-655. By default the channel is set to 6. The Channel can be changed to fit the channel setting for an existing wireless network or to customize the wireless network. If you enable Auto Channel Scan, this option will be greyed out. 802.11g Only – Select if all of your wireless clients are 802.11g. Mixed 802.11n and 802.11g – Select if you are using a mix of 802.11n and 11g wireless clients. 40MHz – Select if using only 802.11n wireless clients.